My RAC teammate Szepes,Tamas also faced a Benko Gambit but played a much nicer game than me and won in style. Black has released white’s a,b pawns in return for having a strong Nd3 in the heart of white’s position. What do you suggest for white? I forgot my scoresheet at the tournament site so the game was reconstructed. Hopefully I got the moves right. My opponent had a hard to spell name which I don’t remember. The Team Captain brought his camera but there was only enough charge to take a couple of pictures. I stumbled into a won position with some non-special play and then noticed the winning move quickly. Then, I looked for an even better one. Sadly my improved ‘win’ had an obvious hole in the idea and after, I struggled to make a draw. The critical position arises after black took the b-pawn with 29…Qxb5. The queen is now unprotected if only Bb4 could find a way to move to make a discovered attack. Portisch,L used a quick double fianchetto with Nh3-f4 against Geller’s Benko gambit in the Biel 1976 Interzonal and won a tough game. Black had earlier sacrificed the exchange for counterplay and now white is playing to convert the material advantage. What do you suggest for white? Here is a recent game by Danish GM PH Nielsen. GM Schandorff recommends the 5.f3 line to fight the Benko but I don’t agree with this choice. Now this game shows a nice way(12.a4) to play against the tricky gambit. Nielsen became an International Grandmaster in 1994. 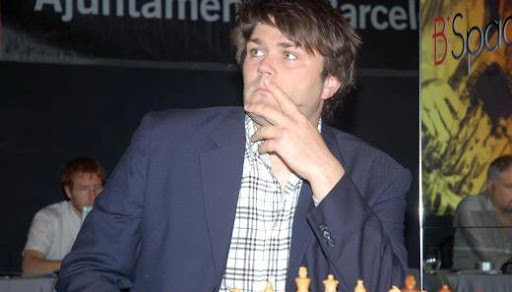 He won the Danish Chess Championship five times: in 1996, 1999, 2001, 2003, and 2008. Things are going well for white. The e5 pawn shuts out Bh8 and white stands fully mobilized. What is the next step? GM Schandorff proposes the line 5.f3 for the task of beating up the Benko Gambit in Playing 1.d4 The Indian Defences(Quality Chess 2012). There is a key sacrificial (12.Nfd5!?) idea at the heart of the active 5…e6 response that needs close checking. He devotes three games to this idea and has some far reaching analysis that I checked as part of the analysis of the following recent game. Key point. This is a fantastic idea that is analyzed in games 59-61 in Playing 1.d4: Indian Defences by Schandorff(Quality Chess 2012). This sacrificial idea is one of the backbone ideas behind the f3 repertoire. White is indicating an attack with his last move. White has the strong bishops and mobile pawns for the piece while black has trouble getting the queenside pieces to coordinate. What do you think black should do? Here I am proposing a small improvement for black. Maybe you will find it too. The Benko Gambit has been getting a lot of attention lately. Here is an interesting effort from the Budapest TCh Rd1. Black has just played the novelty 13…Rfc8. Normally black would play ..Rfb8 with play on the a.b files. Now black can support …c4 and follow with …Nc5-d3 with light square play. How do you assess the move? What should white do next? Seek a refuation? Play a normal move and keep the tension? The position is complicated. What is the right plan for black?